Of the companies that I consider “Trump stocks,” Caterpillar Inc. (NYSE:CAT) is at the top of my list. I mean, how can you not love CAT stock under this administration? Like our President, Caterpillar is big, bold, and blames everything on the Japanese. Okay, that last bit is only a half-truth, although CAT certainly experiences significant competition from Japanese rival Komatsu Ltd (ADR) (OTCMKTS:KMTUY) and I’m sure management secretly wishes it would disappear. Last year, Caterpillar sold $26.6 billion worth of construction equipment, the biggest haul in the world. But a close second was Komatsu, which sold $19.2 billion. In third place was Hitachi, Ltd. (ADR) (OTCMKTS:HTHIY), another Japanese competitor. However, at $8.3 billion sold, the gap is considerable. Thus, Caterpillar and Komatsu are always trading barbs, as they should. This is free-market capitalism at its finest, and no one’s going to blame the other for competing. President Trump is a different story. While on the campaign trail, Trump routinely stated he would make CAT stock great again. Komatsu, on the other hand, was public enemy number one. Interestingly, pressuring the Japanese is one of the campaign promises the President has consistently kept. Overall, the markets enthusiastically rewarded Caterpillar stock. Since that fateful election, CAT shares have skyrocketed over 77%. Moreover, the company produced a standout earnings report for the first quarter. Against a consensus earnings per share target of $2.13, Caterpillar delivered $2.82, a 32.6% positive surprise. Yet, strangely, CAT stock dropped nearly 10% on the earnings release. Furthermore, the construction-equipment manufacturer continued to slip after a few “throwaway” sessions. Not only that, on a year-to-date basis, shares are down almost 8%. Is the economy tanking or are investors unnecessarily punishing Caterpillar stock? Volatility in CAT Stock Doesn’t Make Sense… or Does It? It’s always confusing when corporate shares fall on superb earnings results. But to be fair, this isn’t the first time we’ve seen this dynamic, nor will it be the last. Usually when this occurs, poor guidance lights the fuse. Our own Lawrence Meyers raises this point, noting that management believes Q1 will be the best result for the year. Investors saw that and immediately ran for cover. However, Meyers questions this logic. For one thing, rising steel prices due to the China tariffs will impact margins. But this is a well-known factor for Caterpillar stock, and it’s short-sighted just to focus on this metric. The other point is that the Latin American market improved, which could offset margin-related costs. Blue Chip Growth editor Louis Navellier chimed in, stating that CAT stock was due for a natural correction. Their counterarguments make sense. Here’s the risk, though: if the U.S. construction market (which represents the largest share of the pie) is weak, then Q1 doesn’t really matter. The good news is that domestic construction is soaring from its Great Recession depths. This is mostly due to private sector demand, which is normal. But the not-so-great news is that the private sector excessively outpaces public sector demand. Since 1996, the private sector’s average allocation relative to total construction spending is 73.6%. However, the allocation approached 78% to 79% prior to economic crises. Currently, we’re at 77.3%. 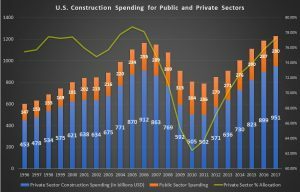 In addition, public sector construction spending peaked in 2009 at $315 billion. I find this trend incredibly strange given Trump’s rhetoric about building the wall and other projects. It’s almost as if the government doesn’t believe in its own growth projections. If that’s the case, that might explain why investors are so jittery about CAT stock. What some bullish investors might be missing is that Caterpillar stock isn’t an isolated incident. What I mean is that CAT isn’t the only construction-equipment manufacturer that’s performed well under Trump. To the President’s chagrin, the Japanese are surprising outperformers. But this year, both CAT stock and Japanese competitors are volatile and disappointing. This tells us that bearish traders aren’t just focused on Caterpillar’s muted guidance or its margin problems. They’re looking at the entire industry, which isn’t giving off great signals. Since 2010, annual growth in domestic construction spending in the public sector averages a 1.4% loss. For the private sector, it’s 6.6%. Clearly, we have a disconnect between what the government reports, and what they’re actually doing. In this case, I’m going to respectfully disagree with my two InvestorPlace colleagues. Rather than irrational fear, the bears are jumping ship for completely understandable reasons. Article printed from InvestorPlace Media, https://investorplace.com/2018/05/irrational-volatility-caterpillar-cat-stock-concern/.